So as I mentioned before my Nexus 10 arrived on Thursday (it's now early Saturday morning as I write this.) So I've had a day or two to play with it, but not really enough time to really sit with it and read a lot. However we're not concentrating here on the review of the tablet as a whole. If you've used a modern Android tablet then you should know what to expect from it and it does all those things. What I'm going to concentrate on here is how good is the device for reading PDFs. Point of comparison, I have a first generation iPad with the lower resolution screen (1024 x 768.) I never found this really useful for reading PDFs on due to the low resolution. Sure it was good for some larger font books, but unless you wanted to zoom it wasn't ideal. The Nexus 10 has a 10.1" screen boasting 2560 x 1600 resolution, so over twice the original iPad. It is a widescreen (16:10) rather than the iPad's 4:3 screen. So what does this mean? It means that the screen in portrait mode (I'm going to do most of this in portrait mode as that's a more natural mode for reading PDFs) is much taller than the iPad's, but about 1/2 inch narrower (5 3/8" versus the iPad's 5 7/8".) As a result if you read a regular PDF on this you will get the black bars at the top and bottom unless you zoom. For most of my tests I used very large and heavy PDFs to try it. I used those with the smallest font I could find and the most graphical umph to them. So the Legend of the Five Rings 4th Edition PDFs were perfect. 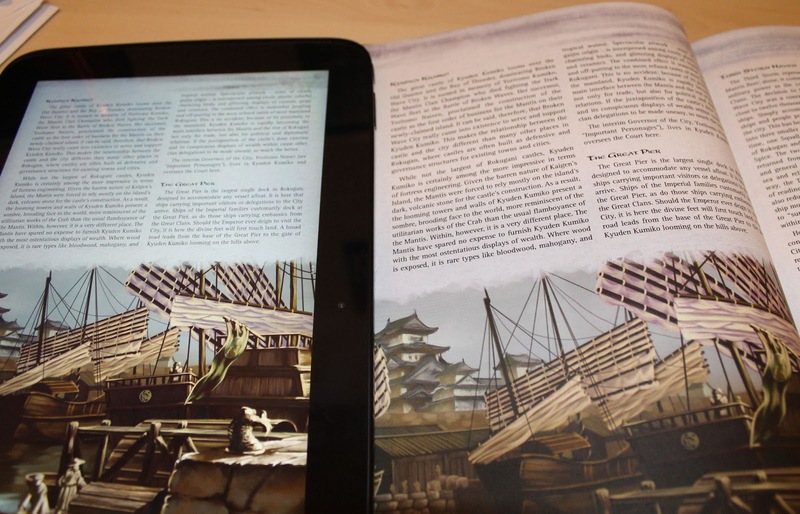 On my first gen iPad the L5R books were readable if you squinted due to the lack of resolution of the screen. Zooming to remove the margins made it more bearable, but unless you zoomed into just a single column of text I would find myself getting a headache in short order. 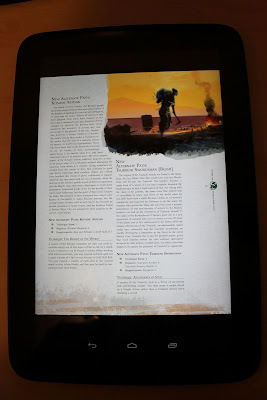 On the Nexus 10 I find the PDFs readable without zooming. Yes the text may appear small to some people, but for my eyesight (I don't wear any corrective lenses at all for reference) I find it readable but almost right on the smallest size for me. If I zoom to remove the margins then it's perfect for me. Of course this varies with PDF, for example all my Shadowrun PDFs are perfectly readable without issue straight off with no zooming. The L5R PDFs however look absolutely gorgeous and the text is pinpoint sharp with the 300DPI screen showing what it can do and doing it perfectly. Clip in full camera resolution to show sharpness of the text in unzoomed mode. Strongholds of the Empire. Using the Strongholds of the Empire PDF for L5R again I was getting adequate performance. If I was reading a page at a time and I have the Cache the Next Page turned on (on by default I believe) it could take less than 2 seconds to turn to the next page. If I'm flicking through the pages quickly, or I jump to another page not adjacent to the one I was last on, it could take up to 5 second to turn depending on the complexity of the page it was going to. So the Strongholds PDF is one of the heaviest PDFs I own. Trying out other PDFs for comparison. Shadowrun 20th Anniversary Rulebook - Moderately heavy PDF in some places, but reasonably well optimized straight off. Completely readable. Cached up to 2 seconds. Not cached up to 4 seconds. Vampire the Masquerade 20th Anniversary Edition - A large PDF (almost 130 mb), perfectly readable. Cached up to 2 seconds. Uncached up to 4 second, but often only around the 3 second mark. Mongoose Traveller Alien Module 1: Aslan - Much lighter PDF than the others on this list. Very readable. Cached up to 2 seconds. Uncached up to 3 seconds. This one did perform noticeably better than the others on the list, probably due to the lack of layers and less graphic intensity. Personally I find those performance figures quite usable, and while they may be considered slightly slow by some they're fine for me. Note that this review was done using the PDFs straight from the publisher as they come. If you were to use a PDF editing program to remove the margins you could make it even more legible. Also most PDF reading programs for tablets come with a crop feature, some allowing a different crop on odd and even pages (both GoodReader for the iPad and ezPDF on the Android allow this) which would allow you to only have the pages show the text columns automatically which again increase the readability. Overall the 1/2 inch difference between the iPad and this shouldn't be a factor unless your eyesight is poor, so on that scale I can only recommend the Nexus 10. If you have a current generation iPad with Retina screen then there is no reason to by the Nexus 10 for PDF reading, you won't gain anything by switching. If however you are in the market for a table to mainly read PDFs on, and possibly do other media consumption, then I can highly recommend the Nexus 10. It's $100 cheaper than the iPad for each capacity level. If you like Android then it's a no brainer. If you want to pay the extra then the iPad is an excellent piece of hardware and seems very suited to reading PDFs. Though I haven't tried it I believe it's possible that GoodReader on the latest gen iPad may shave some off time off the Nexus 10 performance figures. The only real downside to the Nexus 10 is its availability. Currently I believe it's only available direction from Google and the stock is low. I find myself lucky that I've been able to get one as they keep selling out when they're made available. That should fix itself in the coming months, but likely not until after the new year. This is the only PDF centric review for the Nexus 10 I have found! Thank you for writing about this. I mainly want a tablet for PDF reading and it is hard to find reviews. For reference, what is the performance for scrolling through the same PDF on your first gen iPad? I have to make an update to my numbers. I discovered a lot of the slowness on cached pages was due to the page flipping animation on ezPDF. Turning that off helps performance greatly. Using the academic PDF you provided it took on my first gen iPad, using GoodReader it took about 12 seconds to flick through the entire thing. Using the Nexus 10 and ezPDF it took 15 seconds. Using Adobe Acrobat reader on the Nexus 10 is faster than ezPDF, and took 13-14 seconds. Remember though that the Nexus 10 is pushing around 5 times more pixels on that screen. I cannot comment on iPad 3 or 4 performance as I don't have access to them. Thanks for taking the time to post this information and also for mentioning the pdf reading applications. I have been thinking that someone needed to write an app that discarded the white boarders and sounds like this does exist. I want a tablet in order to read technical documentation. I have experimented in the past and resolution was not sufficient to display a full page. My requirement is that a full page is displayed and can be read with no zoom or scrolling. Current plan is to go with a Nexus 10. Dale, check out http://sourceforge.net/projects/briss/ for an app that does what you want. thank you so much for posting! finding it hard to find recommendations for academic pdf reading! hiya, have you tried it with more tablets as of today? Can you flick the pages downwards instead of sideways, on 10 inch androids, is what I'd like to know, as that enables me to see part of one page and part of the next and, in the way it's allowed in the ipad, allows for very fast flcik throughs, unlike when it has to be done sideways? I was wondering if you'd tried Repligo Reader. I tried it and a trial of ezPDF, but I found I couldn't get ezPDF to show a page at a time for landscape aspect ratio documents (it insisted on continuous scrolling mode which I hate). Possibly a PEBPAC (Problem Exists Between Phone And Chair) issue, but still annoying to me. Anyway I would be interested in your opinion on how the PDF readers compare. I use GoodReader on the iPad 3rd generation and it's great, but I've ended up settling on Repligo Reader for Android. What a stunning blog you have..